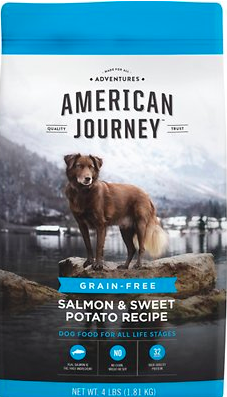 Have You Tried American Journey Salmon & Sweet Potato Recipe Grain-Free Dry Dog Food? 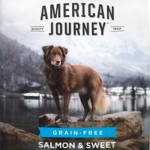 American Journey Salmon & Sweet Potato Grain-Free Dry Dog Food … What Is It? 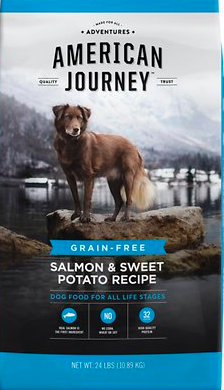 Which Ingredients Are Included In The American Journey Salmon & Sweet Potato Recipe? If you are like me, I use to pay little attention to the ingredient labels on the back of the dry food bags. Over the years, I realized that doing this was unfair to my dog(s) as they weren’t always receiving a healthy diet. Big Mistake! To help you, I have listed the ingredients for this particular recipe. Here are the American Journey Salmon & Sweet Potato ingredients. Deboned Salmon, Chicken Meal, Turkey Meal, Peas, Sweet Potatoes, Chickpeas, Pea Protein, Chicken Fat (Preserved with Mixed Tocopherols), Dried Plain Beet Pulp, Natural Flavor, Flaxseed, Menhaden Fish Meal, Blueberries, Carrots, Salt, Salmon Oil, Dried Kelp, Fructooligosaccharides, Choline Chloride, Vitamin E Supplement, Mixed Tocopherols (Preservative), Ferrous Sulfate, Zinc Proteinate, Zinc Sulfate, Iron Proteinate, Yucca Schidigera Extract, Niacin Supplement, Copper Sulfate, Potassium Chloride, Sodium Selenite, d-Calcium Pantothenate, Copper Proteinate, Riboflavin Supplement, Vitamin A Supplement, Manganese Sulfate, Thiamine Mononitrate, Manganese Proteinate, Pyridoxine Hydrochloride, Vitamin B12 Supplement, Calcium Iodate, Vitamin D3 Supplement, Folic Acid, Dried Bacillus coagulans Fermentation Product, Rosemary Extract. Take a quick look at the first three ingredients: (Deboned Salmon, Chicken Meal, Turkey Meal). These ingredients provide an excellent source of healthy protein that essential to the overall health of your pet. Combined with fruits and vegetables, the recipe offers a quality, nutritional diet. Has There Ever Been A Recall? No. Where Is It Manufactured? The USA, in the state of Kansas. Where do the ingredients come from? The United States and reputable suppliers worldwide. Can you feed this formula to your puppy? Yes, the recipe is formulated for all life stages but it is recommended that you use the puppy formula for your little guy. Dog Food Advisor, a reputable source of reviews regarding dog food products, gave American Journey Lamb & Sweet Potato a 5 out of 5 stars. What Sizes Does The American Journey Salmon & Sweet Potato Dry Come In? 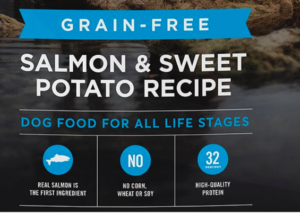 Well, what do you think of the American Journey Salmon & Sweet Potato recipe? After extensive research in creating this article, I feel quite confident in recommending this product to dog owners. As a ‘natural’ dog food, this brand produces their recipes with all the ingredients that are both healthy and nutritious. 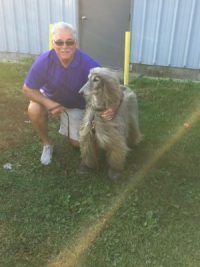 Furthermore, the company seems to put great emphasis on the testing of its products which should give pet owners some sense of confidence when considering this brand. If salmon may not be choice of your four-legged companion, there are other meat choices that are available in the American Journey recipes. Finally, this specific brand continues to grow in popularity as dog owners have become more and more aware of what they are now feeding their pets. As a dog lover, and dog food enthusiast, this is something that brings a smile on my face!